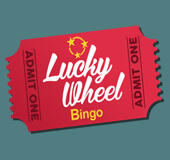 Roll up and step into the magical world of Lucky Wheel Bingo, the newest show-stopping site for 2016! Created by the talented team at Jumpman Gaming, Lucky Wheel Bingo is that latest spellbinding addition to the Wheel of Slots Network! When you enter the lucky red, green and star-studded reels, you'll be greeted by a mysterious host/personal ring master with a top hat holding the lucky spinning wheel, just waiting for you to take it for a spin! The host will warm you up for the show with lucky welcome package, including a spin the Wheel bonus, as well as plenty of ongoing rewards. A feast of magical bingo and slots entertainment then awaits you, so you kick back, relax, take your seat and let the magic show begin! When you roll up to the spellbinding show and make your first deposit of £10, you'll receive a magic welcome package, and can take your golden ticket for a Free spin on the Lucky Big Wheel! You can then take it for a spin to win anything from cash bonuses, Free bingo tickets to up to 500 Free spins on some of the hottest slots around like Fluffy Favourites, Temple of Isis and Shaman's Dream! That's just the start, as you can also play exclusive Free games daily, with mystical prizes and real jackpots up for grabs. If you play the Lucky Gold Elephant game, you can even win your very own real Gold Elephant! There are also a wealth of daily, weekly and monthly themed promotions in store for you, like Fortune Fountain, the biggest Network Community £500 Jackpot game, the Monthly Balance Booster £250 Jackpot and the £10 Guaranteed daily Jackpots! 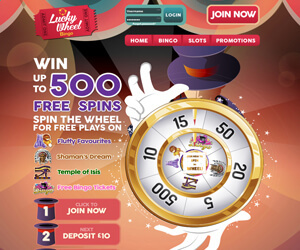 Lucky Wheel plays host to an enchanting collection of magical bingo and slots games! You'll be spoilt for choice with the amount of action-packed 90 Ball and 75 Ball Bingo rooms, with big prizes and jackpot treats in store. You can then take a trip through a whole host of slots adventures, from Fluffy Favourites and Shaman's Dream, Temple of Isis, Sugar Train, Irish Luck Jewel Journey, plus instant games and more!